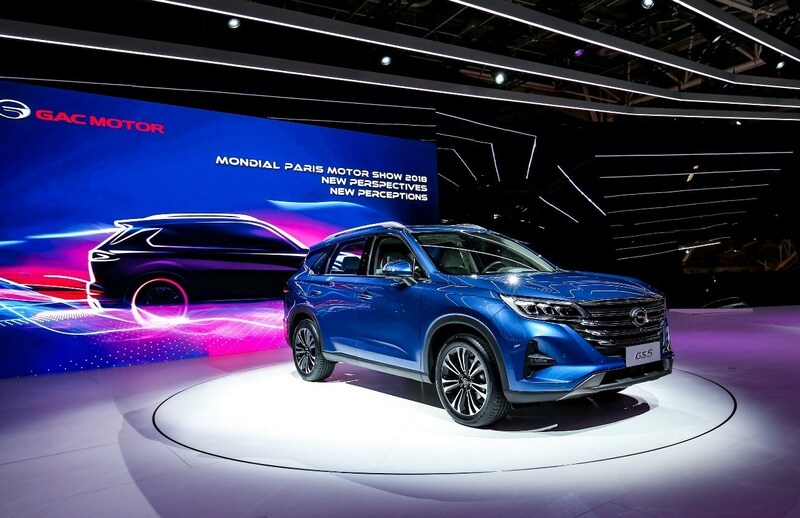 GAC Motor, China's leading automobile manufacturer, has unveiled the all-new GS5 SUV at the Paris Motor Show, making its first foray into the European market by showcasing the latest premium vehicle which features an exquisite design that combines robust power, futuristic styling and robust safety features. The brand's stunning debut in Europe also included the local premiere of the concept car Enverge. GAC Motor is a young Chinese brand developed by GAC Group that ranks 202nd in the Fortune 500. Established 10 years ago, GAC Motor has since built a world-class car manufacturing system composed of their global R&D network, world class manufacturing in production, global supply chain and GAC Motor marketing strategy that adheres to international standards and has roots in the company's vision of a global high-quality brand. GAC Motor is on a sustainable development path that prioritizes quality and innovation for the high-end automobile market, achieving the transformation from "Made in China" to "Quality Made in China" to "Created in China". GAC Motor has become a leader in the domestic market with a compound growth rate of 75 percent and the aspiration to build a world-class brand and a global company. Thanks to the company's rigorous quality control system, GAC Motor's vehicles have been well recognized by the world's leading authoritative organizations. Following ten years of development, GAC Motor has formed a new pattern of global R&D centers, global sourcing partnership and global sales network. In the latest J.D. Power Asia Pacific China Initial Quality Study (IQS), GAC Motor has maintained its title as the highest-ranking Chinese brand for the sixth-consecutive year. GAC Motor's GS8 has topped the quality ranking in the large SUV market segment and became a leading example of quality Chinese automobile brand manufacturing. At present, GAC Motor has established a global sales and service network in 15 countries, including the Middle East, Southeast Asia, East Europe, Africa and America and has been awarded "Best Chinese Car Brand" in multiple overseas markets. "This is GAC Motor's first trip to the Paris Motor Show, and we hope to communicate and learn from fellow world-leading automobile brands on this incredible platform and introduce the GAC Motor brand to more people," said Yu Jun, President of GAC Motor. "Europe has a very special place in the development of GAC Motor. Today, we are excited about our return to Paris with the theme of 'new perspectives, new perceptions' to officially start a brand new journey in Europe". Developed by GAC Motor's R&D centers in Guangzhou, Shanghai and the United States, the new GS5 SUV is designed for young working-class drivers and families. The model, with its steady composure, is ready to meet the challenges ahead. In the lighting design, the model has full-LED lenticular headlights with three diamond cuts on the single side and mighty integrated tail lights made of 190 LED particles, which create a bright, three-dimensional lighting experience. The sides of the vehicle, are adorned with a dynamic line stretching from the head to the tail of the car, integrating the changes of light and shadow on the curved surface to elongate the body. In addition to the stylish appearance, the new GS5's powertrain is equipped with GAC Motor's 3rd generation 1.5T GDI engine and the latest Aisin 6-speed hydraulic automatic transmission. It also carries the latest designed and upgraded A+ chassis, achieving rapid steering reaction and sports-car-level braking power. The star SUV GS4, the high-end SUV GS8, the first minivan GM8, and sedan GA4 also made appearance during the Paris Motor show, earning praise from the audience for the excellent quality and 'smart' connection technology, further demonstrating the strength of China's high-end manufacturing capabilities and the determination of GAC Motor to become a frontrunner in the automobile industry. "GAC Motor has a bright blueprint and will strive for it. We are eagerly looking forward to seeing GAC Motor vehicles on the streets in Europe. In facing the stricter challenges and tests in the mature market, GAC Motor is confident that our leading qualities, technology and R&D ability, will lead to further breakthroughs, creating an enjoyable life of mobility for global consumers," said Yu.